Yosemite is my favorite place on Earth. I grew up right outside the park gate, so it was a regular occurrence to hop in the car after worship on Sunday and spend a few hours in the park. Some of my most treasured memories are things like playing tour guide to every family member who ever visited us, school trips with best friends, ice skating with my crush when I was fifteen, picnics with boyfriends, hiking Vernal Falls with my husband just weeks after our wedding. Above is my favorite photo of my husband Mark and I in Yosemite. It's a very special place to us, because it's where I told him I loved him for the first time. He said it three days earlier, and I waited to respond. I really wanted to be sure I meant it. As we were looking at the view from Glacier Point, I was moved by the beauty, and I knew I wanted to marry him. I turned to him and told him I loved him. It was magical. It was also my dad's favorite place in the world. He loved nature and solitude. He was a quiet, deep thinker who loved God, animals, and nature. Since he's been gone, Yosemite is the place I go to remember him. I know he'd be incredibly proud of my work now, and that warms my heart and keeps me going. As you can see, it's a very special place for me. There are two types of elopements. The first is probably what most people think of, which is when a couple decides to get married on the spur of the moment and goes to the courthouse or Vegas. I'm educating you on the other type of elopement, which is a private ceremony in a gorgeous location. Often, it's just the couple, the officiant, and the photographer. Sometimes the couple invites just their closest family and friends. There aren't rules when it comes to an elopement. It's usually a "destination wedding," meaning that they travel to a location, without a reception. 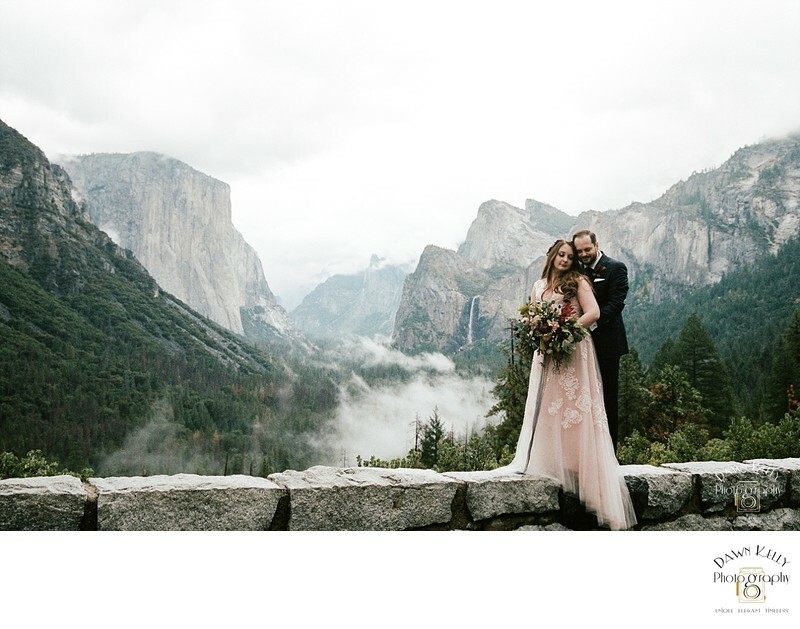 Yosemite is one of the most popular elopement destinations, and when you look at the photos taken in the park, you can see why. Elopements are very popular right now. Many couples aren't up to dealing with the stress of planning a wedding. There is no guest list to agonize over, no large reception to plan, and a lot less money spent. Other couples have done the big wedding before and just want to keep it simple. There are a lot more options for ceremony locations when a couple chooses to elope! Since it's just the bride and groom, they can get married on a mountain top, on any beach, on an island, in the forest, at a historical building, or in a friend's beautiful garden. Elopements are so special because they are just about the love between the couple. I always say, a wedding is for everyone else, an elopement is for YOU. Many of our couples don't bring anyone along. Some bring just close family, and maybe a few best friends. In any case, all of our couples have had a beautiful experience, and their friends and family have been thrilled for them. You can expect to have a chill, fun day taking photos. Say goodbye to the stress of a big wedding, and truly enjoy the day you joined together as one. Yosemite is the most beautiful location in Northern California. It's so majestic that people travel from all over the world to visit. Some of our clients have traveled from Japan, Austrailia, the Midwest, and the East Coast. 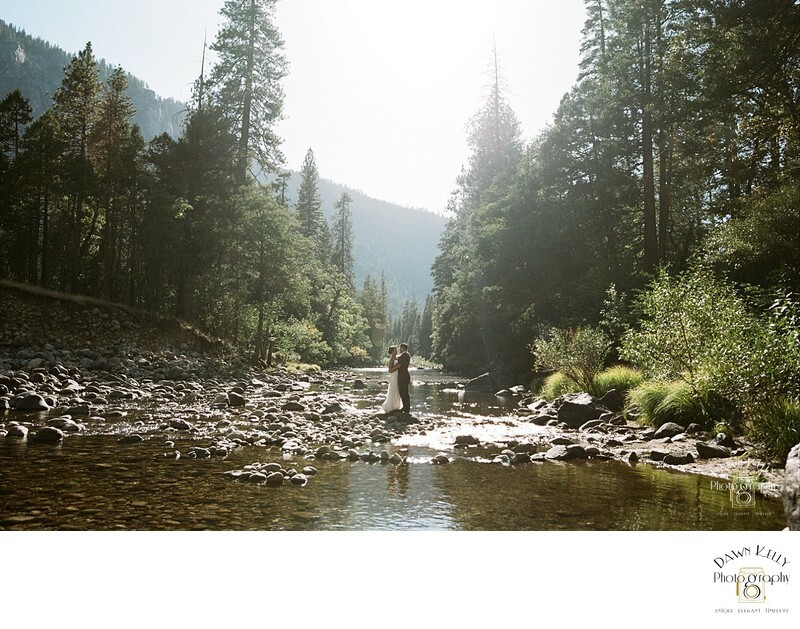 Yosemite is the perfect place for an elopement because there are literally hundreds of gorgeous spots for a ceremony, and exploring the park with your photographer is a blast. You'll have the most beautiful wedding photos ever. If you need more convincing, here's an AMAZING video done by one of our preferred videographers, TTC Studios! Because of the vast amount of time I've spent in the park, I know it thoroughly. I know the best spots, the best light at the perfect time of day for each spot, the most grandiose vistas, and the tiniest hidden nooks. 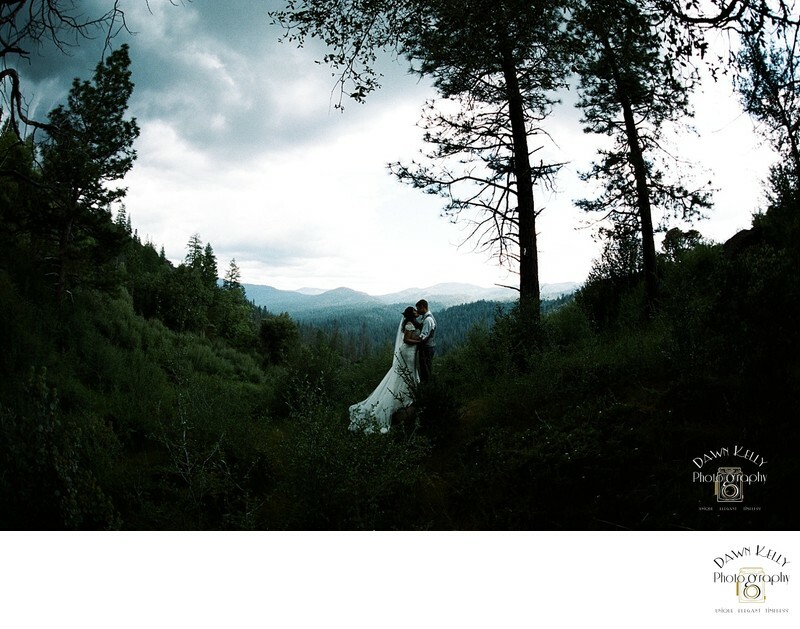 I've teamed up with the best vendors I could find, and we have Yosemite elopements down to a science. Simply put, we are the experts. Let me show you just how beautiful your wedding photos can be. *Brag alert* I was honored to have a thirteen-page spread in Shutter Magazine's April 2018 Travel Edition! I couldn't believe it when I saw how many pages they gave me, and I'm beyond grateful. "If you're reading this...GO WITH Dawn. My husband and I decided on an elopement and had never been to Yosemite, but it was on our bucket list (avid nature lovers and hikers). Dawn was there from the beginning to the end helping and answering all the questions we had (even when she was on an amazing Euro trip with her hubby.) She's one-of-a-kind and has a great energy about her. She'll make your day even more special than you could ever imagine and then when you see the photos you'll literally cry tears of joy. Thank you so much Dawn, we couldn't be happier and couldn't recommend you more." For more from our Yosemite clients, check out our Testimonials page. When planning your elopement, take into consideration the requirements to do so. Yosemite requires a special use permit, which costs $150. They also have a location list that you must stick to if you have more than 10 people. Be sure to consult their Weddings Page for in-depth information on permits and other things, and their Ceremony Locations Page for specific elopement ceremony locations. Glacier Point is my favorite spot to photograph brides and grooms, because I think it's the most gorgeous spot in Yosemite National Park. It has majestic views of the valley, especially of Half Dome. 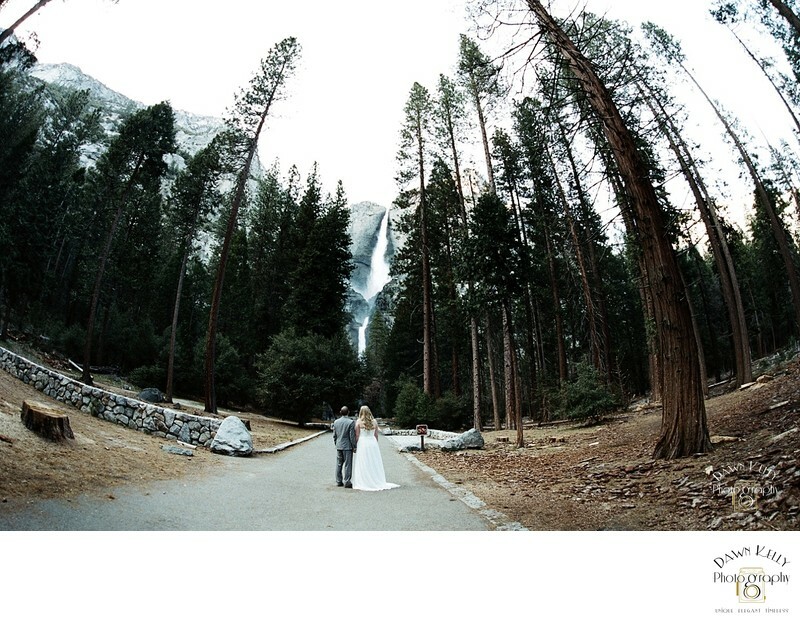 If you're getting married in Yosemite, you NEED a photo with Half Dome, right?! 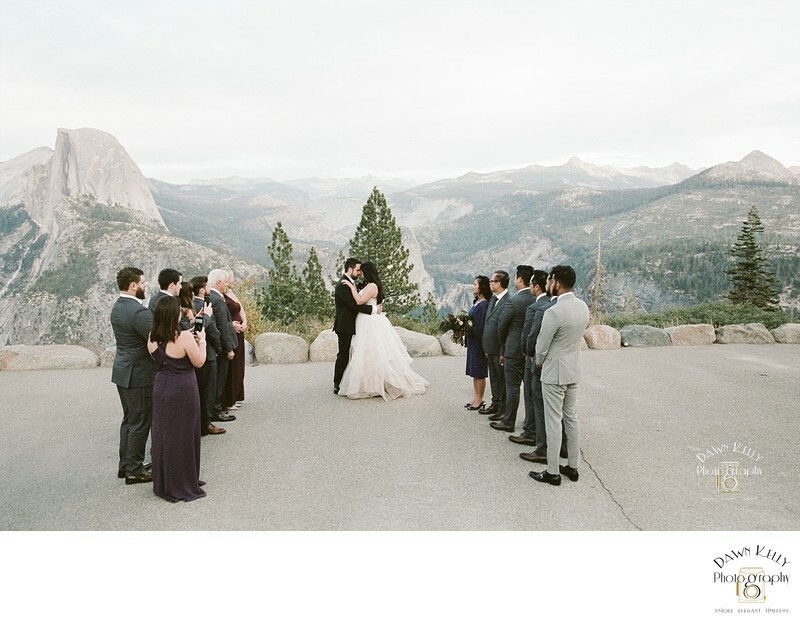 Glacier Point is a STUNNING spot for a ceremony, especially when you're bringing family. Two medium sized parking lots offer parking, and it's tough to get a parking spot when the park is busy. Short, paved (wheelchair accessible) trail takes you to the vista. On the way from Yosemite's valley to Glacier Point, is the amazing lookout at Tunnel View. It's a famous, dramatic landmark as you head to Yosemite's valley from the route 41 entrance. It's such an iconic view because it showcases El Capitan, Bridal Veil Fall, the Three Brothers, with Half Dome peeking through the mountains. Tunnel View is one of the ceremony locations listed on Yosemite's web site, but it's not ideal for a ceremony because it's always covered in photographers catching the ever-changing light, so there is zero privacy. I love to stop here on our way to Glacier Point for portraits with this epic and historic view! Mariposa Grove is located in Wawona. I have recently fallen in love with the huge area of Wawona! Did you know that the valley is only 5% of the park? Don't miss out on all the variety the park has to offer. If you stay in Wawona, there's great opportunity for us to explore the area and work our way towards the valley. This area will soon be under restoration. The Merced River runs through the entire park, starting in the upper country. There are many gorgeous spots in Wawona and the valley. All of these beautiful wooden walkways are accessible from parking lots, and therefore very easy to get to. People often forget about Sentinel Beach, which is a shame, because it's BEAUTIFUL! So much variety for photos, including Yosemite Falls, the Merced River, and tons of woodsy areas. This little river-side beach location is breathtaking. El Capitan is in the background, and it's surrounded by beautiful trees and mountains. If you look really close, you can see climbers on El Capitan that look like little specks on its majestic face. Swinging Bridge picnic area doesn't seem like much when you drive up, but if you explore it, there's so much to use for photos. 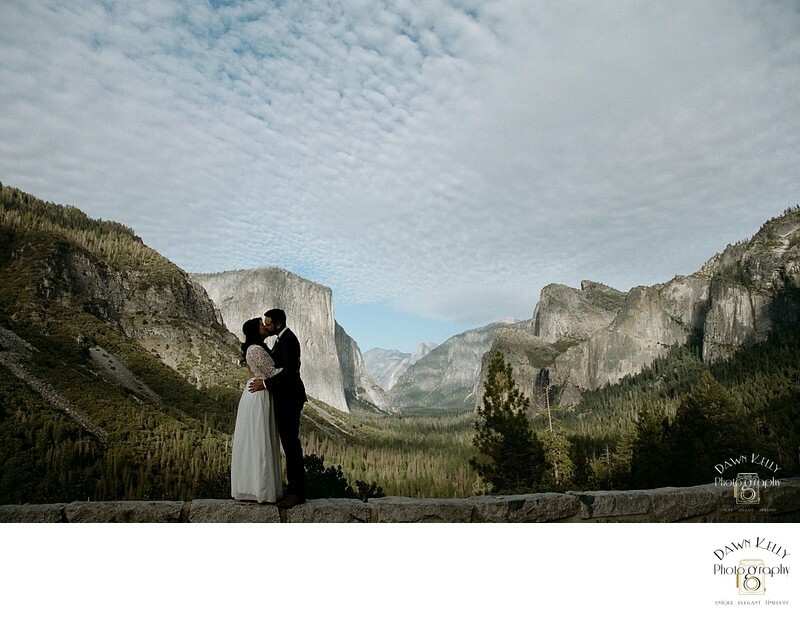 It's on Yosemite's list of ceremony locations, and it's STUNNING for a ceremony! 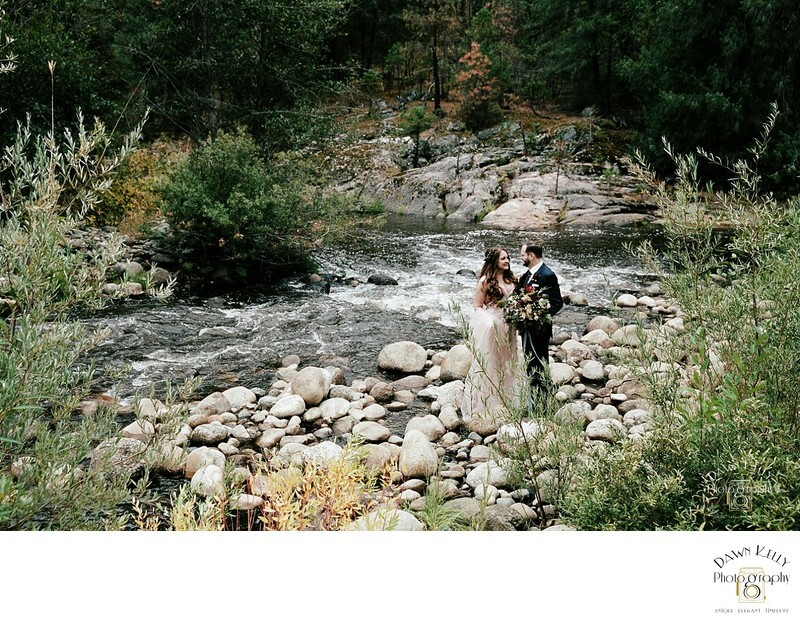 This location is on Yosemite's official list of ceremony spots, and it's beautiful! Yosemite Valley Lodge is right across the street, so there's tons of parking, the buses stop there, and it's flat, making it easy to walk. El Capitan Meadow is my absolute FAVORITE meadow! It's right in the middle of the valley, which makes it easily accessible. It's especially beautiful in the fall. More of Yosemite's Gorgeous Meadows! Yosemite has a multitude of meadows, and each one provides a unique majestic view. I can shoot in meadows in Yosemite a hundred times and not have the same backdrop twice. Imagine exchanging vows with this amazing view! Be sure to stay on trails! There are amazing little nooks and crannies EVERYWHERE in Yosemite. Because I've spent so much time there, I have my own secret spots! Any time you plan to travel to Yosemite, you should check their Current Conditions Page for weather conditions, construction, wildfires, and road closures. While it's true that you don't have to bring anyone along to your elopement, if you have children, bringing them along would make your elopement extra special. If one or both of you have children, they're a large part of your marriage. They are going to have a new step mother or step father, possibly new step siblings, and they're about to be part of joining two families into one. Step children can make or break a new marriage. I've seen many marriages suffer due to unhappy step children, children who don't feel important or loved. Excluding them from your elopement can sorely hurt them, and every parent just want their children to be happy. Start off on the right foot, and it'll help happily blend your family. What kind of ceremony will you have? There are many many options for elopement ceremonies. Most couples who elope go with a simple ceremony with just their officiant and photographer. Some bring parents and siblings only, and some bring their closest family and friends. It's your day, so do it your way! Michelle & Dean had an official ceremony at Cathedral Beach with a hand full of close friends and family present. It was really beautiful and everyone really enjoyed being there. If you're having your ceremony officially in the park, you must get a permit. You can get your marriage license at any County Clerk's office in California and there's no waiting period. Some couples get married at their local courthouse, then do a private vow and ring exchange in Yosemite. Megan and David exchanged vows under a tree in the golden sunlight. It was beautiful. FAQ: How do we handle our marriage license, and do we need a park permit? The short answer is that you can get your marriage license in any of California's County Clerk offices. You do need a permit to get married in Yosemite, and that costs $150. For details, check out my FAQ license and permit blog. 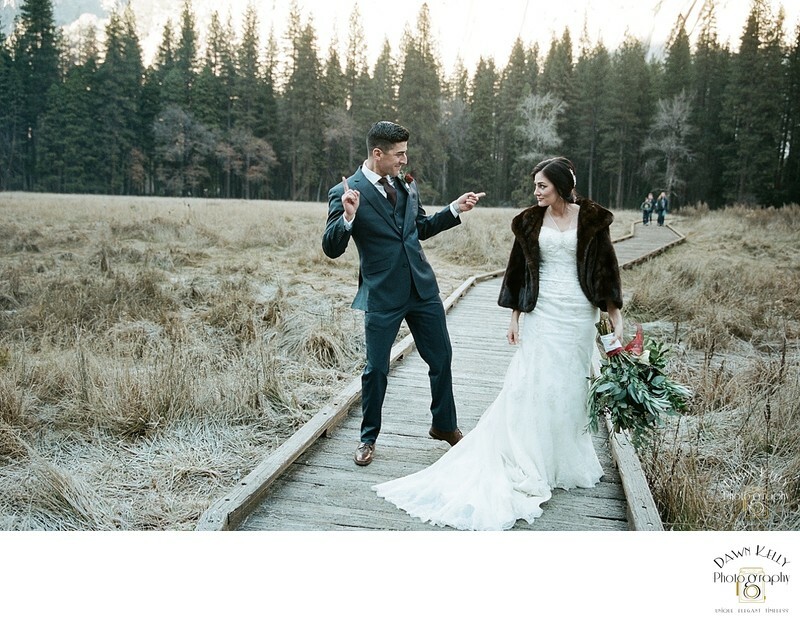 When getting married in Yosemite National Park, you must consider weather conditions. Each season has its unique elements you should be aware of while choosing a date for your elopement. 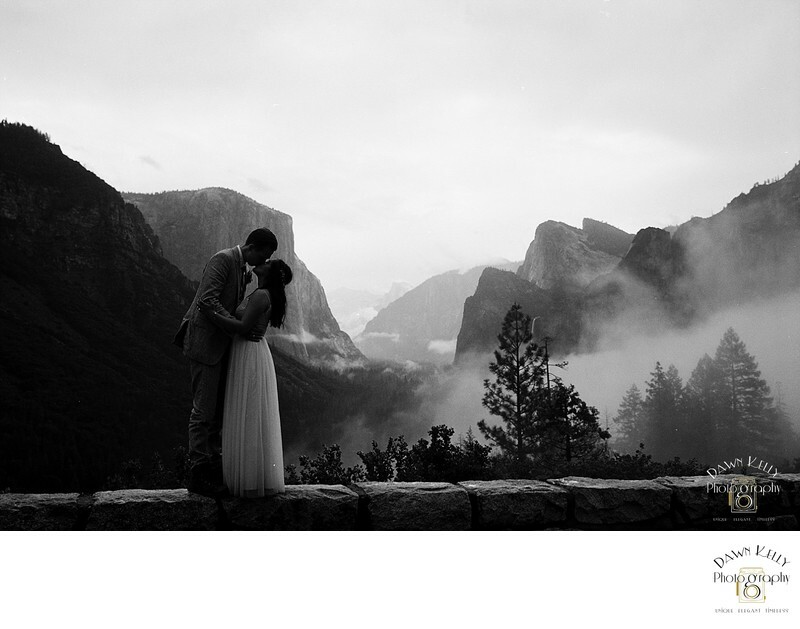 Spring is a beautiful time to get married in Yosemite. The park is very green and the waterfalls are gushing like crazy! Waterfalls are a universal symbol of Yosemite, so having a waterfall in your photos will scream, "We got married in Yosemite!!!" One issue we run into in the spring is the muddy meadows. So if you're not opposed to kicking off your shoes and walking through the mud like us locals do, we can still shoot in the gorgeous meadows! The other issue we run into is periodic rain. When it does rain in the spring, it's usually a light rain, and you can bring umbrellas, which makes for super cute photos! Check with the Park to see what the weather conditions will be, and for any possible flooding. You can expect the temperature to be between 65-75 degrees in the spring. Summer has fantastic weather. It doesn't rain and the weather is always beautiful. Because of the high elevation, it never gets above 90 degrees, usually staying in the upper 70s and lower 80s. The waterfalls are usually still running, although not as strong as in the spring. The entire park is open in the summer, so you can venture up to Glacier Point, Sentinal Dome, or Taft Point, or if you're adventurous, the upper country Yosemite wilderness! 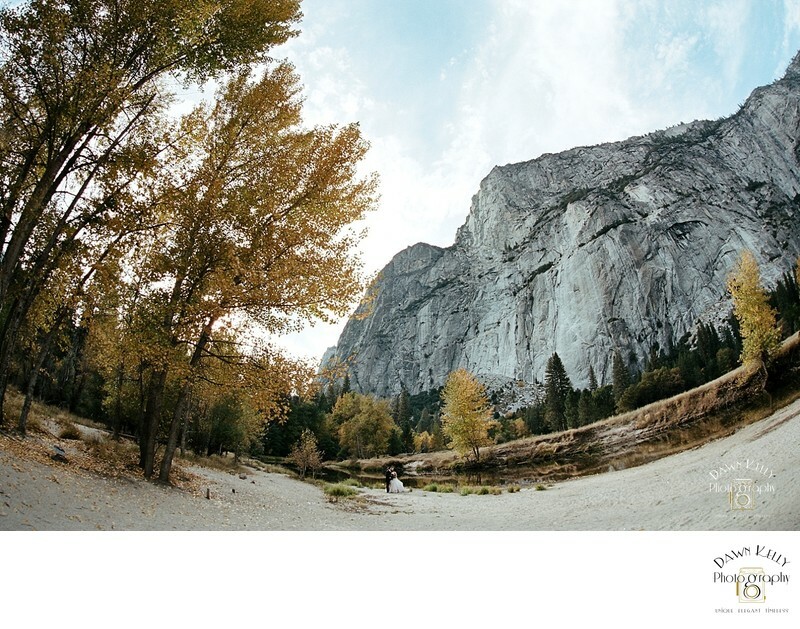 Fall is, by far, my fave time to photograph weddings in Yosemite. The fall foliage on Yosemite's valley floor is GORGEOUS in October and November. If planning an elopement in the fall, keep in mind that there's a descent chance for rain from October on. We aren't deterred by rain, and just run around the park with umbrellas. You can expect the temperature to be between 60-75 degrees in the fall. Winter has challenges for sure, but if you want your photos in snow, it's worth it. There is nothing more beautiful than Yosemite in full snow. Parts of the park are closed from October to May because of icy roads, so we can't shoot up at Glacier Point or Taft Point during these months, but there's so much beauty in the valley floor, so it's a worthwhile trade-off. There are beautiful views of Half Dome and El Capitan from the valley floor, and many meadows that fill with snow. If you really want to be in the snow, we suggest December or January. You can expect the temperature to be between 25-65 degrees in the winter. 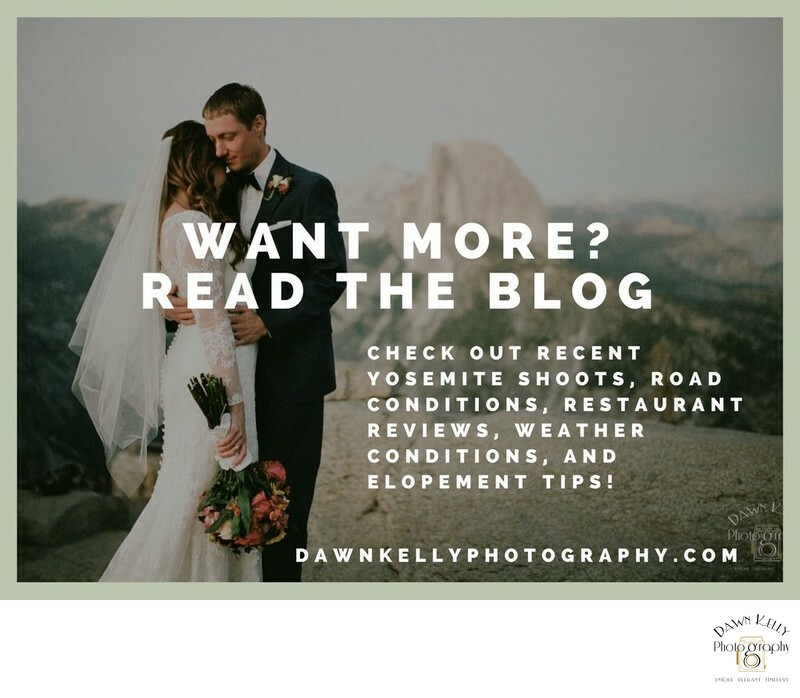 Regardless of when you decide to elope in Yosemite, you're going to have a beautiful ceremony, a fun time, and gorgeous photos! OK guys, I'm about to get real. Let's talk about the bathroom situation in Yosemite. It's bad, guys. It's real bad. The vast majority of bathrooms in the park are outhouses. You can always spot a local, because we come out of the outhouse in summertime and we're not holding our hands over our nose and mouth because of the smell. After 35 years, I'm now used to it. Most people aren't. They smell horrible and they're very unsanitary. The Majestic Yosemite Hotel (The Ahwahnee) has the very best bathrooms. If you're driving through the valley doing wedding pictures, this is a perfect option because your dress will stay clean and there's good light to touch up makeup. Yosemite Valley Lodge is almost as nice as the Majestic Yosemite Hotel. Always clean and in good working order. Big Trees Lodge (Wawona Hotel) is an adorable antique hotel on the way up to the big trees and Glacier Point. Their lobby has a nice bathroom. Half Dome Village (Curry Village) has a building with a store, cafeteria, coffee shop, bar (oh yes! ), and pizza stand. There are nice bathrooms inside next to the restaurant. Yosemite Village has basic bathrooms next to the store. If you're wearing a wedding dress, I don't recommend it because it's not very clean and the floor is usually wet and dirty from so much traffic. Mariposa Grove was just renovated, and now has brand new flush bathrooms! To find more flush bathrooms in the park, Google "Lodges in Yosemite." Altitude sickness is no joke. My first time shooting in the summer at Glacier Point (7,500 ft elevation), it was 90 degrees and I ended up dizzy and throwing up violently. This really shocked me, because I grew up in the area, at high elevations, and I've never had it happen before. If it can happen to me, a local and regular to the park, it can happen to you, your family, or your guests. Most people are fine in Yosemite Valley (4,000 ft elevation). It's when you start to climb to Glacier Point and the back country that you need to worry. When it's hot, it's ten times worse, because of what the heat does to the air. Because of the thin air at higher elevations, it's harder to get enough oxygen into your blood, and therefore your brain. That's why the first symptoms are numbness in your hands, dizziness, and labored breathing. As soon as you start to feel this way, sit in the shade, take some really deep breaths, and sip some water. It should pass in five minutes or so. I suggest you bring pieces of dried ginger and Gatorade so that if you get nauseous, you have something to help before you start vomiting. If you do vomit, it's okay, I won't judge you, because I've done it too! For an elopement, you can choose to wear whatever you want! Want to wear white leather pants? Fine! Want to wear your grandmother's tea-length wedding dress? Awesome! How about a long gold sequined cocktail dress? Go for it! An elopement is about you two, not about 150 guests murmuring about the food they don't like and the dress they think isn't traditional enough. The whole point of eloping is not having to deal with stressful decisions and making your family happy. You don't have to bring your mother, grandmother, aunt, and second cousin to shop for your dress. You don't have to listen to every single opinion. Just wear what you want to wear! In the fall and winter, when it's cooler in the park, bring a wrap or cute jacket. Many of our clients choose vintage fur wraps, which adds a unique twist to their styling. Check out our What to Wear board on Pinterest! I have some great suggestions for breakfast, lunch, and dinner—especially if you’re starving after our time together. Located inside the Majestic Yosemite Hotel, this is a great option if you want an upscale experience. Built in 1925, the hotel and restaurant have been a bridal destination ever since. With vaulted ceilings, stained glass, rich wood, and massive chandeliers, it's incredibly romantic. A breakfast buffet is served Monday through Saturday, from 7:00 AM to 10:00 AM. On Sundays, a brunch buffet is served from 7:00 AM to 2:00 PM. This is their most popular service. Lunch is served from 11:30 AM to 3:00 PM. Their lunch menu is more affordable than their dinner menu. Dinner is served from 5:30 PM to 8:30 PM. Their dinner service often books up, so whether you have a large party or it's just the two of you for dinner, make a reservation! View their MENU to see their selection and prices. I've eaten at all the restaurants inside the park, and this is my absolute favorite. If you still want the amazing ambiance of the Majestic Yosemite Hotel, but don't want a full meal, or are on a budget, their lounge is fabulous. It's on the left when you walk into the lobby. They have a great appetizer menu, including sandwiches, salads, soups, and other simply delicious bites. The portions are pretty large, so three appetizers for two people is perfect. They have a good wine selection and also serve mixed drinks. I really like a spiked hot cocoa with lots of whipped cream if it's cold outside, and a lavender lemonade if it's hot. Sometimes reservations aren't required, so call and make one just in case. Be sure to stroll through the entire lobby and look at the amazing architecture and huge fireplaces. P.S. The large gift shop inside the Majestic is amazing, full of Native American jewelry and other keepsakes. 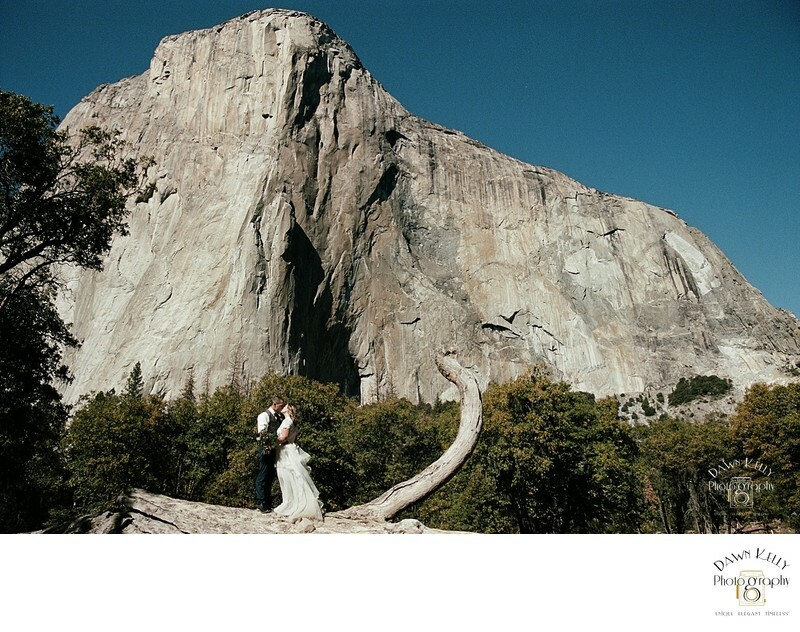 Some brides purchase a piece of jewelry to remember their amazing Yosemite wedding day. This is the next best in most people's opinions. It is an upscale Victorian hotel, so take a walk around while waiting for your table. They also have a fireplace where you can enjoy champagne and other cocktails. You will need to make reservations. There's a climbing tradition in Yosemite that involves coming down to the valley, taking over the pizza patio, and pigging out while trading harrowing stories. If you eat on the patio, you can hear them talking, which is pretty fun. The pizza is delicious and fresh, with pretty much any topping you want. DO NOT order the gluten-free pizza. It looks and tastes like cardboard. So if you're gluten-free, head inside to the cafeteria for a hot meal or fresh salad bar. As a documentary-style wedding photographer, it’s my job to tell the story of your one-of-a-kind day. I want to make sure we’re a good fit, both in style and personality, so I can capture the true essence of your day and who you are as a couple. Supreme customer service and quality of product are extremely important to me, so time constraints prevent me from accepting every job. Custom wedding cakes and dessert bars are available from Cakewalk Heirloom Baking Co.
*We have teamed up with many amazing vendors to put together even better, more comprehensive all-inclusive packages, including video, hair, and makeup. We believe the team of vendors that we have contracted with is an amazing and talented team. However, we cannot guarantee the product of any services provided by any separate vendors. If none of these packages meet your needs, we are happy to put together a custom collection for you. Contact us today to reserve your date. If you're interested in working with us, fill out the form below and you'll hear from me within 24 hours.